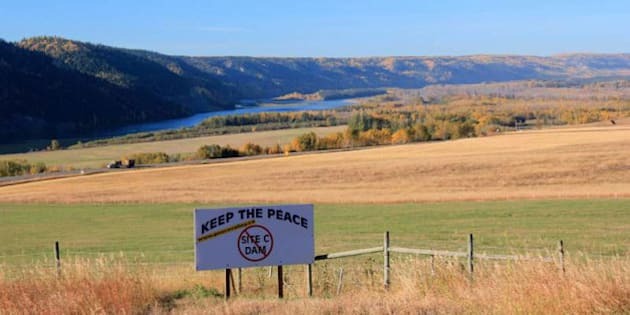 Panel chair Harry Swain says that the province went ahead and approved the construction of the Site C dam in haste at a time when, "there's a whole bunch of unanswered questions, some of which would be markedly advanced by waiting three or four years." The B.C. government's failure to investigate alternatives to the Site C dam was a "dereliction of duty," according to Harry Swain, who chaired the federal-provincial panel in charge of reviewing the mega-project. The Site C dam, which was greenlighted by the B.C. government in December 2014, will be the largest infrastructure project ever undertaken in the province. The project has met huge opposition from landowners, First Nations, and conservation groups. And rightly so, given that it will flood 83 kilometres of the Peace Valley. The joint review panel chaired by Swain issued a 471-page report in May of last year, making 50 recommendations to the provincial and federal governments. The recommendations were far-ranging and comprehensive, calling for further investigations into the potential negative impacts on the environment in the Peace Region, to respecting the rights of First Nation's communities in the area. Now Swain is speaking out. In an exclusive interview released this week by DeSmog Canada, Swain says that the province went ahead and approved the construction of the Site C dam in haste at a time when, "there's a whole bunch of unanswered questions, some of which would be markedly advanced by waiting three or four years." "You shouldn't take decisions before you need to," Swain said. "That means you'll have much more information when you finally have to take a decision. Building electricity facilities in advance of need only costs money." For us British Columbians who will be on the hook for a whopping $9 billion to build the dam, Swain says that the province ignored his panel's recommendation that the cost projections for Site C be scrutinized by the independent B.C. Utilities Commission. "Knowing that the province had decided to exempt the project from the scrutiny of the utilities commission, we nonetheless felt that that was not good public policy and recommended otherwise," Swain said. "They of course gave us the back of their hand." Good public policy takes time, and why wouldn't the province take advantage of the capacity of an independent group like the B.C. Utilities Commission to ensure taxpayers are getting the best bang for their buck? Without a spade in the ground, the Site C dam's price tag has spiked from an estimate of $6.6 billion in 2007 to close to $9 billion today. And if this project is like most other public works projects, you know that final number will be even higher. These are not small numbers and the Site C dam is not a small project. With such a whopper of a price tag and experts like Harry Swain recommending further due diligence, what exactly is the rush?